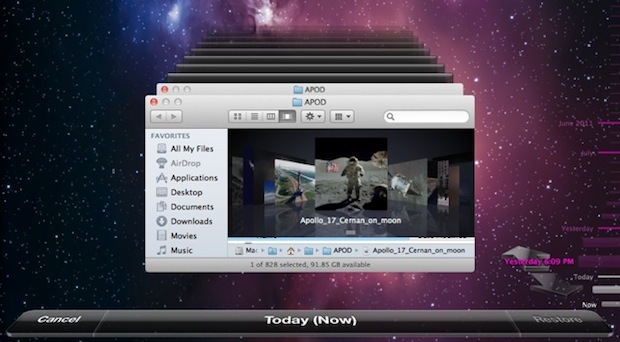 Time Machine in Mac OS X Lion initiates a sometimes useful, sometimes not feature: local backups. Called snapshots, this seems to be kicked off when your primary Mac is a laptop and the Time Machine backup is an external drive, so OS X Lion compensates for the potentially unavailable external disk by keeping an additional backup locally on the Macs primary hard drive. This has its obvious advantages, since you can restore to past Time Machine backups right away from anywhere, but if you’re trying to conserve disk space this can be a real pain. Note: Time Machine local backups are only stored if you have Time Machine enabled in general. Remember, if you disable this feature you will not have local backups anymore, so if something goes wrong you will be out of luck. It’s important to have regular backups of your data, and so if you’re going to disable this be sure to still use Time Machine, perhaps even initiating a manual backup before you disconnect the drive, in order to preserve a recent copy of your data. I want to adjust the frequency of the backups to 2 to 3 a day. I would recommend if you have an SSD to turn this off. As long as you have backups on another disk you should be okay. How do I delete the existing local backup that is already on my drive? Disabling the local backup deletes it. I am currently having this issue with OSX 10.9.4. I deleted old backups from my external and then for some reason I now have 148GB in other data. I’ve tried everything you stated and turning on and off time machine. I’ve tried restarting numerous times and also trying manual backups. Still I have 148GB in other data. Can you please let me know what else it can be? I have the same problem. Time machine ruined my laptop. It now dropped to a speed of one byte per minute with everything. This beautiful colored little wheel is all I get now. You can’t erase the damage done by time machine. Buy a new laptop, seems to be the only answer. If i dont disable it. Will the local backups be deleted from my internal drive after the next time machine backup or will the local backups forever be kept on my mac even after a time machine backup? They’ll always be there in case you have to use the recovery partition in Lion, disabling deletes it. Also if you disable the feature and for any reason use a new disk for Time Machine it’s re enabled. Thanks! I’ve been looking for this info all day! I’ve been through a few forums with recent activity and it seems a lot of people are confused (like I was) at why so much disk space is gone after installing OS Lion. All forums I found until this one still had people scratching their heads. – Is there any way to manage this though. Like I can with my external hard drive? – Will it manage itself and delete old backups when you got to a certain amount of disk space? Like my external does? – Is the only way to delete the stored backup by disabling it through terminal? Seems like after a short time, SSD will be filled. I do like the idea and have chosen to keep it on, then off and back on after external backup, to clear the unneeded space on my SSD. Do note that the local backups are automatically deleted if the space is needed for “real” files — in fact Finder does show this space as available. So you are not actually wasting any space with having local backups on. Note: You may notice a difference in available space statistics between Disk Utility, Finder, and Get Info inspectors. This is expected and can be safely ignored. The Finder displays the available space on the disk without accounting for the local snapshots, because local snapshots will surrender their disk space if needed. snapshot is the state of a system at a particular point in time. The term was coined as an analogy to that in photography. It can refer to an actual copy of the state of a system or to a capability provided by certain systems. you can. it just won’t show up when you type it. just type in your password and press enter even though you won’t be able to see it. it does that to me too. Thanks for this, that was driving me nuts ! Great thanks managed to clear out more than 50 GB of space, honestly thats a lot! Really worked – thank you so much. Cleared 132gb that was being used for ‘Backups’ and I’ve never even bothered with Time Machine. You can also just open the Time Machine preferences, turn off Time Machine, turn it back on, and the local backups will be removed after a few seconds. This is nice when you just want to do it once in a while but generally like the feature. It’s not quite so cool, but it works. Also, note these backups will *never* interfere with your disk space. So if you need 4 GB for something, and your backups are taking up that space, the local backups will automatically get removed to make room. Except that it does not always. I get this “Your system has run out of system memory” and it is because the “disk” has filled up with these backups and is not available to the swapper to create new swap files it appears. This is in Yosemite and Mountain Lion from personal experience at work and home. I am trying this to try to reclaim HD space from mysterious “Other” that is filling it up. Definitely seems to be related to Time Machine. I took the recommended steps but it’s not helping. Other is still taking up 254GB of my HD. I took this to the Genius Bar once before and they cant figure it out. The Other files don’t appear in the finder. same story here. It’s really sad. My mac is evicting everything that’s mine and getting filled up with this mysterious “other”. I have the same issue – I used the hack on this page, but it’s just re-classified the backup (which is now zerokb) to ‘Other’. Anyone know how I can delete this ‘Other’ so I can get more space on my drive? Apologies – it resolved itself after I started another manual Time Machine backup. I got all my space back – yay! I started with and continue to go through all my files deleting things which are duplicate and are not needed without a whole lot of luck. It always seems that this portion of what is stored is always almost exactly what makes up all of the other categories (apps, music, movies, photos, backups)… any ideas?